At Citroën, the history of the van begins in the twentieth century. Berlingo comes from a long line started in 1928 with the C4 van. In 1950 is presented the famous 2 CV minivan, 100% utility version of the cultured 2CV, which becomes a real iconic model. In 1978, 2 CV Fourgonnette is replaced by Acadiane. The real breakthrough came with the 1980s with a new offering: Citroën C15 which reaches more than 1.18 million units assembled in 22 years. The other great revolution of the late twentieth century, called Berlingo! The very first generation appeared in July 1996 again shakes the codes by bringing more distinction and comfort. Berlingo innovates with a specific silhouette and an integrated load cell, of which only he has the secret. His name will become over time synonymous with reference on the segment. - A consistent front face of the brand identity and its big brother Citroën Jumpy: a tall and short hood, large optics. - In profile, fluid lines and worked flanks. A promise of practicality and generosity of interior volume. LIKE YOU, IT DOES IT ALL ! - Extenso (R) cabin: 3 seats in the front, mobile office and loads of long objects for more modularity. - Grip Control with Hill Assist Descent, raised ground clearance (+ 30mm), large wheels (690mm) with Mud & Snow tires for more traction. - A payload increased to 1,000kg, reinforced lighting, half-height lashing rings for convenience. A version called "Driver", specially designed for companies and their employees who have to make long trips or to multiply deliveries in urban areas. Well-being and practicality for everyday efficiency. 1 -The Extenso® Cabin can accommodate 3 people at the front with a 2-seater bench. 2 - Folding center backrest provides mobile office function with its adjustable writing tablet. Lockable lockable storage is also available under the seat. 3 - The raised side seat frees up a useful extra space for transporting the most delicate objects, thus increasing the loading volume from 3.3 to 3.8 M3 in size M and from 3.9 to 4.4 M3 in XL size. The Loading Zone Pack will make everyday life easier with enhanced LED lighting, 4 additional lashing rings and a 12V socket. New Citroën Berlingo Van filters all the demands of the road in all conditions. Its optimum driving comfort comes from its high driving position, its suspensions and its acoustic insulation. Its seats adapt to all sizes: they are adjustable in height, at the lumbar level and are accompanied by an individual armrest. Heated seats are also available as an option. On a daily basis, you'll also enjoy hands-free access and start, electric parking brake and color head-up display that are among the 20 driving aids you can enjoy. You can load a computer on the 220V socket and put it in the TopBox. On the practical side, you get wireless charging for your smartphone. In addition, two USB sockets and two 12V sockets are also available. With the Extenso® cab, you work comfortably thanks to the adjustable writing tablet when the backrest of the central seat is folded down. The extensive modular cabin is the ideal solution for teamwork. Available in Size XL, it offers a unique comfort in rank 2 with a knee space record in its category. Thanks to its modularity, it allows the transport of long loads when the row 2 side seat and the front passenger seat are retracted. To increase the load volume, row 2 is retractable and the load-stop mesh screen slides on the back of the front seats. For maximum volume and length, it is also possible to retract row 2 and the front passenger seat. 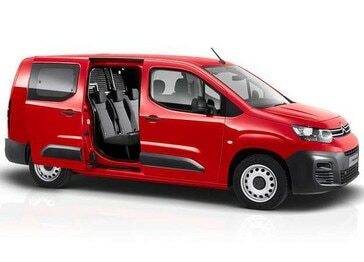 New Citroën Berlingo Van is a real concentrate of useful technologies in everyday life. New Citroën Berlingo Van offers a new innovation in the utilities: Surround Rear Vision technology for unparalleled visibility. A 5 '' color screen in place of the central rearview mirror displays images of two cameras (one in the foot of the passenger mirror / one at the top of the swinging rear doors). - Rear environmental monitoring: the display shows a view of the long-range rear zone in the vehicle axis for a better understanding of the driving environment. - Reversing camera - the display shows a view of the near rear area for easy reverse maneuvering. 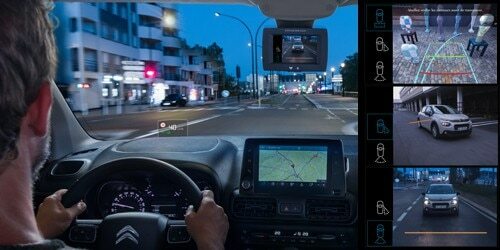 The connected 3D navigation system, Citroën Connect Nav, benefits from voice recognition to control the Navigation, Phone and Media functions without ever leaving the road of the eyes. Associated with connected services like TomTom Traffic for real-time traffic information, it can provide information on the location and prices of petrol stations, car parks and the weather. Equipped with Grip Control with Hill Assist Descent, New Citroën Berlingo Van can modulate the traction of its front wheels depending on the terrain encountered and maintain its speed downhill even on steep slopes. For efficiency, this technology - always associated with the site pack - also allows you to enjoy 30 mm raised ground clearance, an undercarriage protection plate and large wheels with a diameter of 690 mm. Mud & Snow tires. (For countries: as well as a uniform spare wheel). A new lightweight platform and efficient engines for dynamic road handling, real driving comfort and optimized cost-efficiency. - 4 diesel versions: BlueHdi 75 BVM, BlueHDi 100 BVM, BlueHDi 100 S & S BVM, BlueHdi 130 S & S BVM6 and EAT8. - 1 petrol version with the PureTech 110 S & S BVM6 available in 2019. The latest generation of EAT8 "Efficient Automatic Transmission" 8-speed automatic gearbox with paddle shifters offers real driving pleasure over long distances as well as on multiple daily journeys.